Can you feel the spirit of Christmas in the air? Just in time to spread the joy of the holidays, yuletide rock ensemble WIZARDS OF WINTER are announcing “An Evening With WIZARDS OF WINTER” – a 20-city U.S. tour beginning November 19th in Ft. Lauderdale, FL and ending on December 29th in Harrisburg, PA. Featuring original members of the TRANS-SIBERIAN ORCHESTRA, the WIZARDS OF WINTER perform an entire set of original holiday music at each stop of their theatrical, family-oriented rock opera experience. See below for a full listing of tour dates. The “An Evening With WIZARDS OF WINTER” experience is emphasized by music from the ensemble’s recently released original Christmas rock opera album, Tales Beneath A Northern Star. The libretto and music together take the listener on a journey throughout space and time on the night of Christmas Eve in search of the true meaning of the season. The WIZARDS OF WINTER are currently in the studio recording their brand new full-length album The Magic Of Winter, coming soon. Take an early listen to their new single “The Spirit Of Christmas” below. Tickets for “An Evening With WIZARDS OF WINTER” are on sale now and available for purchase via www.wizardsofwinter.com/tour-dates/. Throughout their history, the WIZARDS OF WINTER have performed to packed theaters throughout the Northeast. Every night is like lightning in a bottle with the ensemble firing at all cylinders, and every year, the band’s stage production becomes the new yearly tradition for another fan. The WIZARDS OF WINTER are an eclectic group of musicians from the NY/NJ/PA tri-state region who perform classical and progressive-influenced rock music woven throughout a theatrical holiday-themed event. 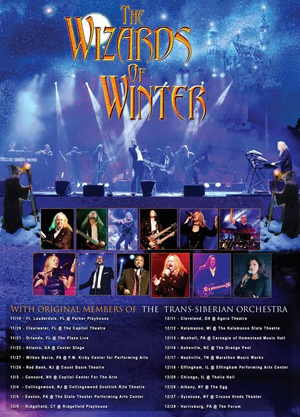 While the group’s style is undoubtedly inspired by the genius of the TRANS-SIBERIAN ORCHESTRA (TSO), the WIZARDS OF WINTER are far from a TSO tribute band. The the WIZARDS’ original material is very unique and has a broad audience appeal, applied in a more intimate setting. As a testament to the virtuosity of the group, several original members of the TRANS-SIBERIAN ORCHESTRA have joined the WIZARDS OF WINTER on their musical journey. Currently performing with the group are Guy LeMonnier and Tony Gaynor. Joe Cerisano, Tommy Farese and Michael Lanning, also former members of TRANS-SIBERIAN ORCHESTRA, have performed with the band on occasion as well.